There isn’t really a good template for getting old as a rapper. 2 Chainz, at 39, just released the best record of his career, a result of years spent pounding the mixtape and guest-verse circuit. Most rappers don’t have that hunger, though. JAY-Z’s 47 and seems much more comfortable smoking cigars and talking about digital distribution than he does lacing 16 bars. Ka is 44 but raps like an ancient god unwittingly exhumed by hubristic men. El-P and Killer Mike, both 42, found a fountain of youth in each other’s righteous fury. On his third solo record, Boomiverse, Big Boi chooses a path of cheerful irrelevance. The only possible thing to say about it is that you will like it if you like his other solo records and would also like a third album exactly like them. He’s still trafficking in the elaborately lush productions and cartoon hooks of 2010’s Sir Lucious Left Foot and 2012’s Vicious Lies And Dangerous Rumors, and the guest list—featuring Big Rube, Young Jeezy, Adam Levine, and Kurupt—could’ve all been culled from either of those, too. (The lone exception is a man named “Trozé,” who may or may not actually exist.) Gucci Mane was a revelatory presence on 2010’s “Shine Blockas”—an incandescent all-timer, and still the crown jewel of Big Boi’s solo career—but here he comes across as yet another safe pick, subsumed into Big Boi’s comfort zone, which the rapper seems bound and determined not to leave. As an MC, he’s still effortfully performing pirouettes full of corny technical firepower; you already know exactly how he delivers the line, “I’m King Cole, like Natalie and her daddy be,” which is the sort of semi-impressive, wedged-into-place rhyme scheme it’d be nice to hear him evolve beyond. More damningly, his sense of melody seems to be slipping, as evidenced by the syrupy hook of “Overthunk” and the gee-whiz romance of “All Night,” which seems designed for the closing credits of a Hollywood comedy. All of which sounds pretty damning—good lord, the hook of “Freakonomics” is “every girl I see got a PhD in freakonomics”—if not for the fact that, well, it’s all pretty good, in that shrugging way we have come to accept the intermittent releases from aging rock stars to be. Paul McCartney, Eric Clapton, Sting, even post-millennial Neil Young—these are once-vital musicians who settled comfortably into releasing new batches of unambitious, easily consumed new music every few years. 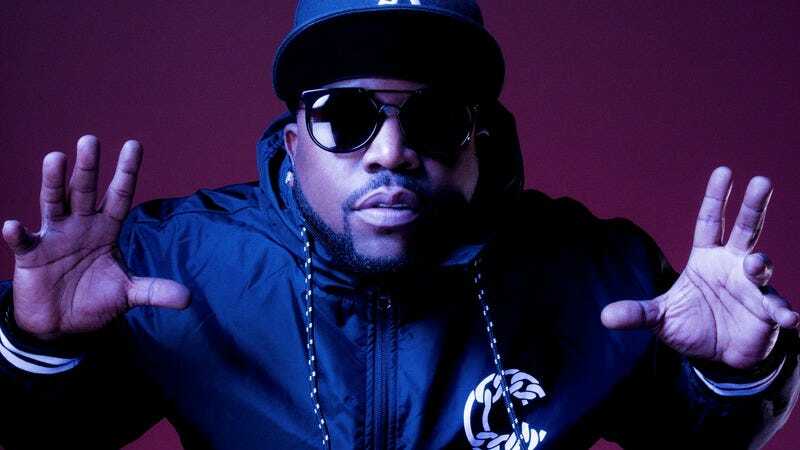 Big Boi is quietly blazing a trail into such well-fed, festival-circuit comfort food for rappers, which—if a little dispiriting for people who still remember what he meant the first time he sent a track out to old-school players and new-school fools—is not such a bad thing, all in all. Everyone needs a retirement plan. Purchase Boomiverse here, which helps support The A.V. Club. Though its reach won’t likely go too far beyond Wilco’s diehard base, Jeff Tweedy’s solo acoustic Together At Last could serve that not-insignificant crowd as a sort of fans-only, alternate-universe hits collection. Tweedy chose 11 songs from his vast catalog—including Wilco and various side projects—and reperformed them minus bells, whistles, and band. His picks are presumably personal favorites, and they don’t cross over neatly with the songs that Wilco is known for by the world at large. Tweedy digs deep elsewhere in search of songs that make sense in this format: Another side-project song, Golden Smog’s “Lost Love,” gets sweetly chilled, and the Summerteeth deep cut “In A Future Age” loses some of its flair from the album version but gains intimacy. That’s true of this whole exercise, really, but the trade-off works fantastically well on those particular songs. Elsewhere, it’s more a matter of just pulling the core out of great songs and removing the occasional jam at the end: The classic “I Am Trying To Break Your Heart” may be the only one here that doesn’t make as much sense, considering it’s close enough to the studio version to be only equally useful rather than revelatory. Purchase Together At Last here, which helps support The A.V. Club. Since his emergence a half-decade ago, Young Thug has cemented himself as one of the most idiosyncratic voices in music. No one chews vowels with more vigor (as heard on “Take Care”: “I’m with the dogs and we bar-kEEEin/ I’ma take off like a mar-shEEEin”), making words we’ve heard thousands of times sound brand new, his manic delivery best resembling a sentient ball of Silly Putty. Billed as his long-awaited major-label debut, as well as his “singing album,” Beautiful Thugger Girls’ forays into such genres as country and dancehall prove there’s no terrain on which Thug cannot find his footing. As accessible as a Young Thug album is likely to get, it finds him bending pop into his likeness rather than contorting himself into something unfamiliar and dulling his edges in the process. In fact, its focus on physical pleasures within the confines of a long-term relationship (Thug and his fiancée Jerrika Karlae have been engaged since 2015, and her presence can be felt all throughout the record) most recalls 2013’s Beyoncé, another record that showcases lust within the context of a committed, supportive union. “Feel It,” the album’s emotional—and carnal—centerpiece, is Beautiful Thugger Girls at its raunchiest and most tender. This is perhaps the album’s most impressive party trick: Few artists manage to balance wide-eyed eroticism with genuine warmth, and fewer manage the feat while packing multiple albums’ worth of hooks into each song. For Thug, it’s just his default mode. Purchase Beautiful Thugger Girls here, which helps support The A.V. Club. Australia’s King Gizzard & The Lizard Wizard started out as a jam band among friends, but has since turned into a prolific fantasy rock outfit, continually churning out full-length releases—Murder Of The Universe is the second of three this year—perfect for your next role-playing game night or road trip to the Renaissance faire. Its love of high concepts manifests here in a tired conceptual through-line about a dystopian society where it’s man vs. machine; seven of the first eight tracks are called “Altered Beast” or “Alter Me” or some variation thereof. (Good luck keeping those straight.) It veers into narration by “Han-Tyumi The Confused Cyborg,” who’s distressed by a “Vomit Coffin”—a cut that could be a bit of a jam if the lyrics consisted of more than just repeating those two words, which somebody obviously thought were amusing to put together. Like most jam-band efforts, it was likely a lot more fun to create than it is to listen to; you can practically hear the band giggling in the background. Which is unfortunate, because at its best, King Gizzard can offer a lazily sensual jazziness in tracks like “Work This Time,” or even work up punk sensibility by way of black metal in previously coherent cuts like “Gamma Knife.” Here “Digital Black,” apparently the ultimate victory of the machine over man, comes closest to matching those previous heights. But overall this record requires a huge narrative commitment, with the payoff of a vomit coffin. Not worth it. Purchase Murder Of The Universe here, which helps support The A.V. Club.